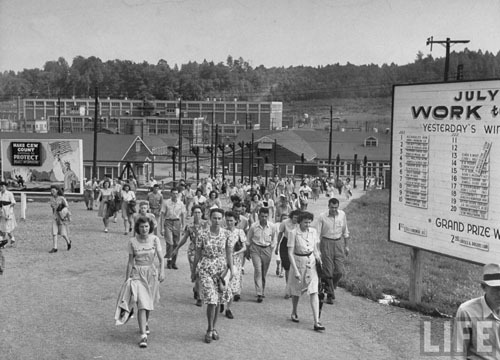 Photo: Oak Ridge, taken by Ed Clark for Life Magazine in 1945. Details here. Since visiting the Cold War Modern exhibit I’ve been looking for more information on the American National Exhibition held in Moscow in 1959. So far I’ve turned up depressingly little that I didn’t already know, but I did stumble back into Google’s Life Magazine archive. When it was launched a few months back I vaguely noted that this project sounded interesting. Now I’m convinced that it’s one of the best things on the internet. Search for anything from 1860 to 1979 (the Nixon/Kruschev kitchen debate, for example) and it turns up photo after photo after brilliant photo. If you have a few hours to lose, do go take a look. On an entirely unrelated note, I’ve made some changes to the design here: out go the red leaves, in comes something more blue (this is a decision entirely unrelated to politics). If you spot any oddnesses, please let me know.